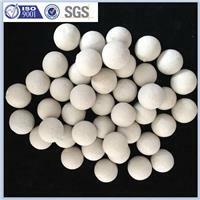 Inert Alumina Ceramic Ball is widely used in petrochemical industry, chemical industry, fertilizer industry, natural gas industry and environment protection, etc. Which function mainly as the covering and supporting materials for catalyst in reactors and packing for towers. Its principal role is to accelerate the distribution of gas or liquid, and support or protect the active catalyst, which especially has the relevantly lower mechanical strength.